The blackbox for Air France Flight 447 was recently recovered thanks to a submersible robot. A small piece of a tragic mystery has been solved. This past weekend, a team lead by France’s Inquisition and Analysis Bureau (BEA) used a submersible robotic vehicle, Phoenix International’s Remora 6000, to recover the flight data recorder or ‘blackbox’ from Air France flight 447, which crashed in the Atlantic Ocean almost two years ago. While it is suspected that flight speed indicators failed during AF 447’s flight from Brazil to France, the exact causes of the crash are still unknown. While it could still take weeks for the BEA to analyze and report on the information contained in the flight data recorder, the friends and family of the 228 victims of the flight will soon have some much needed answers. Thanks in no small part to robots. The lead up to the first dives of the Remora 6000 is shown in the follow video, which is entirely in French. An English transcript is available on the BEA site. The Remora 6000 is an unmanned remotely operated vehicle about the size of a coffin (1.7 x 1 x 1.2 meters). The robot was created by US based Phoenix International to assist in underwater exploration, recovery, and construction. This is only the latest of missing airplanes that it has helped to excavate, having been instrumental in analysis of Yemenia Flight 626, Adam Air Flight 574, and Tuninter Airline Flight 1153. For the AF 447 mission, the Remora 6000 had to venture down to 12,800 feet (~3.9 km) below the surface, considerably farther than for past flights. Luckily the robot can survive down to depths of 6 km without problems. Using its two manipulator arms and color cameras, the operators of the Remora were able to locate and retrieve both the flight data recorder chasis (a 12 hour dive on April 26th) and the much more important memory unit (a shorter dive on May 1st). Such a successful retrieval would not have been completed as quickly, perhaps even been possible, without robots like the Remora. The Remora 6000 (yellow) was launched from the Ile de Sein, and operated off an incredibly long tether all the way down to nearly 4 km. Even before the Remora 6000 was sent to explore the wreckage, robots had been at work. When AF 447 when down on June 1st 2009, it’s exact location was still a mystery. 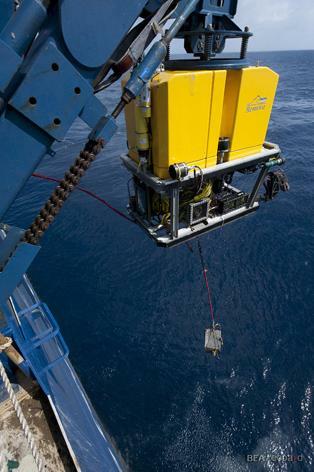 To find the missing plane, the BEA used robot vehicles, to explore thousands of square kilometers of ocean floor. These robots included the CURV 21, Triton XLX, and the Remus 6000. In April, when the wreckage of the transatlantic flight was successfully located, it made sense to send robots again to explore the jetliner’s remains and seek out information that could explain why the plane had crashed; hence the use of the Remora 6000. The integral use of robotics in the recovery of AF 447 is another indication that human exploration is slowly being supplanted by machines. Granted, submersibles like the Remora, CURV, Triton, and Remus are remotely operated, meaning that humans are still firmly in the control loop. In these cases, robots are augmenting, not replacing us. Yet we’ve certainly seen other projects in which autonomous exploration machines are operating without human guidance for months on end. Even if plane crashes are still too important to be handled by unguided robots today, the same is unlikely to be true forever. We’re quickly approaching a time when it not only makes sense for humans to stay high and dry on the support ship, it makes sense for them to let computers handle the most basic decisions as well. Someday soon exploration (whether on land, under the sea, or in space) will be more automated than not. For now, however, the work of both robots and humans is far from over. While the flight data recorder from Air France flight 447 has been recovered, the other ‘blackbox’, the cockpit voice recorder, has yet to be found. While one of the two could be enough to answer most of our remaining questions, there’s little doubt that the BEA will be satisfied with anything less than a full retrieval. That means many more dives for the Remora 6000, and many more long shifts for its controllers. Hopefully the Remora will remember to give its human crew plenty of time to rest.